As the final days of school wind down for the seniors, Mollie O’Keefe looks back and remembers all of the amazing memories that she had while attending IHA. She was a part of many different clubs and activities at IHA including the Internet Safety Squad, Culture Club, and Respect Life. O’Keefe was also was the President of the Wellness Walkers Club and Co-President of the Book Club. Wellness Walkers was one of her favorite experiences at IHA. She made friendships that will “last a lifetime” and she will miss Mrs. O’Sullivan and Ms. Donoghue. One of the other accomplishments that Mollie has achieved is being the events coordinator for the Christian Service Board, which helps plan the community service for the school. She was a part of the CARE mission trip last summer. “[It was] an inspiring experience that made me realize that I can make a difference,” she said. Mollie has reached many different heights while being at IHA. She was even a student ambassador who helped welcome new girls to IHA. Outside of school, Mollie was a Valley Hospital Junior volunteer. She did this for four years and this really made an impact on her life. It was very rewarding to her and she was able to meet some very interesting people! 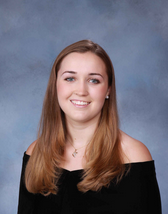 It is no wonder that she was chosen to be a part of the National Honor Society and was accepted into Villanova University for the class of 2019! She plans to major in Economics and she can’t wait to be a wildcat!